We can use these web services to access ChEMBL data from within Vortex, the following scripts illustrate some of the means to do this. 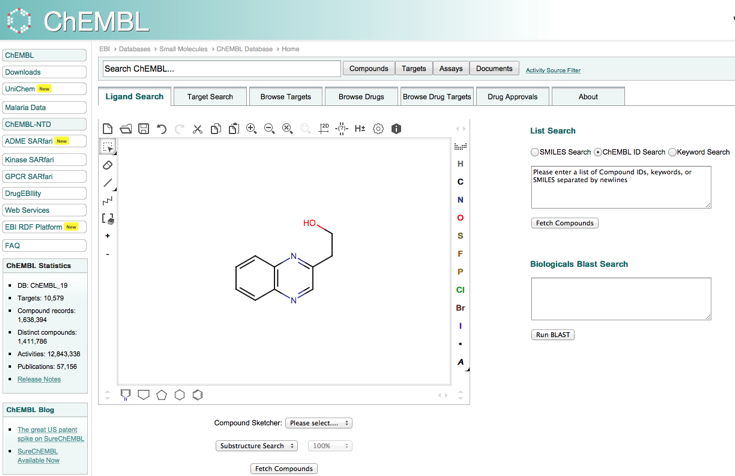 UniprotID to ChEMBL target information. When reading interesting results in the literature it is often useful to find out more about a particular target, this script uses the Uniprot ID to interrogate ChEMBL using the “Get target by UniProt Accession Identifier” web service to bring back target information. Because we can’t be sure what the column containing the Uniprot IDs will be entitled (e.g. 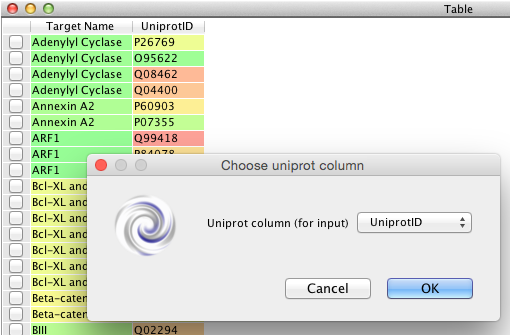 Uniprot ID, uniprot_id, UNIPROTid etc) the first part of the script pops up a dialog asking the user to select the desired column. We then construct the query string to access the appropriate web service, and then pull back the data. There is a little error trapping because some Uniprot IDs may not be in ChEMBL. mystr = "http://www.ebi.ac.uk/chemblws/targets/uniprot/" + uniprotID + ".json"
The data is returned in json format as shown below. The last part of the script parses the data and populates the table. After pulling back the target information associated with a particular Uniprot ID we may want to find out more about the compounds that have been tested against this target. The table now contains the ChEMBLID (highlighted in red) for the target and we can use this to interrogate ChEMBL to find all molecules that have been tested against this target. To capture the desired ChEMBL ID we need to know the column and the particular cell containing the ID. To do this we can use an action from the user right-clicking on a cell to capture the contents. We also capture the text in the “preferred_name” column to use as the label for a new workspace that will contain the results. We then construct the URL needed to access the web service and then pull back the data. mystr = "https://www.ebi.ac.uk/chemblws/targets/" + taskID + "/bioactivities.json"
The last part of the script parses the data into a cvs string, and then create column headers. We then create a new workspace using all the items we created in the script. The result is shown below, a new workspace showing all molecules that have been assayed against that target. You need to put this script in the “context” folder which is inside the “Vortex_Add-ons” folder. Whilst the table above contains the textual information associated with an assay it does not include the chemical structure. This script uses the parentcmpdchemblid field and the https://www.ebi.ac.uk/chemblws/compounds/CHEMBL1.json web service to access the chemical data. By parsing the data we can pull out the SMILES string and populate the table, Vortex them renders the SMILES to display the structure. It is also possible to modify the script to access the calculated properties and add them to the table. mystr = "http://www.ebi.ac.uk/chemblws/compounds/" + chemblId + ".json"
Now we have a workspace containing all the molecules tested against a particular target, the next step in the analysis might be to select an particularlyy interesting molecule and see if there is any more biological data in ChEMBL associated with the molecule. The data is returned in this format and can be parsed to populate a new workspace. TableName = taskID + " BioProfile"
mystr = "https://www.ebi.ac.uk/chemblws/compounds/" + taskID + "/bioactivities.json"
The four scripts can be downloaded from here. These two scripts need to be added to the scripts folder. Whilst these two scripts need to be stored in the context folder which is in the VortexAddon folder.